The largest official Autobot, Fortress Maximus has just the right tool to open up that box. 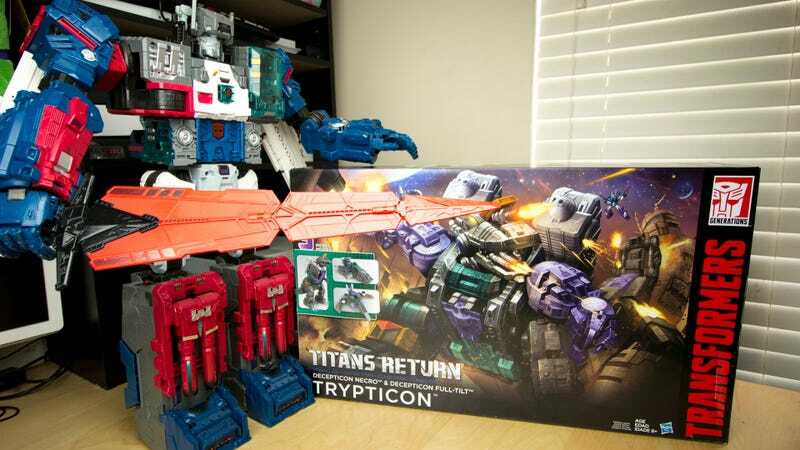 Back in 2015, Hasbro asked Transformers fans to choose between Autobot Omega Supreme and Decepticons Scorponok and Trypticon as the next massive titan-class toy. City-sized T-rex Trypticon won, and now he’s on my desk, with a friend ready to help open him up. Honestly I was pulling for Scorponok, the Decepticon scorpion/base/robot who served as the arch-nemesis to Fortress Maximus in the original cartoons and comics. But while we’ve seen several different versions of Scorponok through the Beast Wars and Unicron Trilogy animated series, we’ve not had a proper Trypticon toy since the ‘80s. And with the beast playing a huge role in both the War for Cybertron and Fall of Cybertron games, it’s only fitting he have his time in the spotlight. But first, we’ve got to get the $149.99 dino robot out of his box, the poor thing. Trypticon is okay. Do not worry about Trypticon. Standing 20 inches high in dinosaur mode, Trypticon is officially the largest Decepticon produced by Hasbro. Certainly too large to come fully assembled in a box. “This is fine,” says Trypticon. And so he comes packaged with his legs off. Big fan of purple here. Trypticon comes packaged with a smaller robot named Full-Tilt, a fresh take on the companion packaged with the 1986 original. Since this is a toy in the Titans Return line, Full-Tilt is driven by a tiny robot named Necro, who transforms into his head in robot mode. Just about as generically Decepticon as a robot can get. But Full-Tilt is just the side dish here. The main event is that massive metal monster robot. Attaching his legs to his body is a little tricky, requiring a bit more force than I like to use in really expensive toys. Several early reviews have pointed out problems with the design of the robot’s hip joints, with strong springs and weak plastic potentially destroying the joints if overused. Something to watch out for. That said, Trypticon is a massive beast that only moves when he really wants to. Look at his comically tiny arms. How can he fight with baby arms? You got the baby arms, Trypticon. In robot mode, which is to say dinosaur mode, Trypticon is an impressive update to the generation one original. The recently-released Platinum Edition reissue of the original toy. All the beats are hit here. Orange clear bits, teal and purple accents, dark gray body. They’ve just added a whole lot more detail. Bonus sticker fun! I will apply these over the weekend with a glass of wine. I am most impressed with Trypticon’s head. It’s got all the charm of the original. It’s even got the orange pop-up bit with the gun hidden underneath. It kind of makes him look like he’s a ginger unicorn. Further tying in with the Titans Return theme, this Trypticon has a throat. I am not sure if any other Transformers toy has ever had a throat. This is where the food goes. I suggest filling it with mayonnaise. The throat hole is just the right size for the little Titan Master head robots to be swallowed, where they’ll languish inside Trypticon’s mechanical stomach until they are digested and come out the other end. Or I suppose one could just open up the panel and let them out. Along with his signature robot mode, Trypticon comes with two additional forms. First we have the city mode, which is the main reason I am not doing a video for this toy. It is far too massive and sprawling. As his Autobot counterpart Fortress Maximus can combine with other Autobots to increase his sprawl, Trypticon can combine with other Titans Return Decepticon leaders to extend his city mode, forming Nemesis Command. I don’t think there is enough room in my office to do this. Yes, it’s a city, Fortress Maximus. Like you have any place to talk. Then we have my favorite alt-mode, the space cruiser. I love this mode, mainly because it folds everything up so neatly and doesn’t take up my entire desk. I’d buy this as a spaceship before city mode as a city. It’s almost got a sort of Star Wars vibe to it, like any moment an army of droids or a bounty hunter is going to pop out. Pay no attention to Trypticon’s dinosaur face poking out the back. I’m mighty impressed with Trypticon. He’s a fine addition to the ranks of massive Decepticons. Giant Starscream is standing on his tiptoes in this shot. Best of all, Fortress Maximus finally has someone his own size to play with. It’s been lonely sitting up there on the dusty shelf, with only Metroplex to keep him company. Sure, the two giant machines should be at each other’s throats, but we’ll suspend hostilities for now. Until the inevitable conflict arises, these two titans will be the best of friends.